A species of dinosaur that packed hundreds of teeth inside its giant beak has just been described by scientists. The Gryposaurus, discovered in southern Utah, had a distinct duck-like bill and a powerful, strengthened jaw. The two-legged creature, described in the Zoological Journal of the Linnean Society, was more than 10m (30ft) long. I want to wear the muttonchops of a Master Skybax Rider. Wasn't there a Gryposaurus in Hatchling? 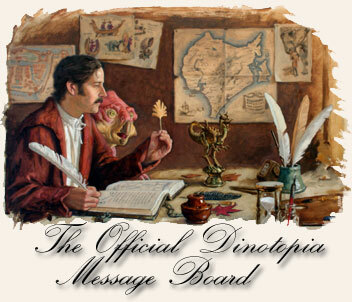 Contribute to the Dinotopia Wiki! Help make it informative. Oh, and pretty, too. The Backbone Shipping Company RP is Ready to Roll Again, and We're Happy to See New Faces! The ferocious Velociraptor, made famous in the movie Jurassic Park, was probably covered in feathers. A re-assessment of a fossil forearm unearthed in Mongolia in 1998 has revealed an array of small bumps. In modern birds, such "quill knobs" are the locations where secondary feathers, the flight or wing feathers, are anchored to the bone with ligaments. The American Museum of Natural History and the Field Museum of Natural History report their study in Science magazine. Full story! I take it this is especialy timely, considering the preview pics I've seen for Journey to Chandara? Birds' dinosaur ancestors were shrinking long before the development of flight, researchers say. In the current Science magazine, they show off a tiny Mongolian creature (Mahakala omnogovae), which came from the same dinosaur grouping that also led to birds. It lived 80 million years ago. I thought it was pretty neat, and kinda cute ... then I realised that it was rendered actual size on my monitor. Tiny!! A colossal collision in space 160 million years ago set the dinosaurs on the path to extinction, a study claims. An asteroid pile-up sent debris swirling around the Solar System, including a chunk that later smashed into Earth wiping out the great beasts. Other fragments crashed into the Moon, Venus and Mars, gouging out some of their most dominant impact craters, a US-Czech research team believes. Its study, based on computer modelling, is reported in the journal Nature. "We believe there is a direct connection between this break-up event, the asteroid shower it produced and the very large impact that occurred 65 million years ago that is thought to have wiped out the dinosaurs," Dr Bill Bottke from the Southwest Research Institute, Boulder, Colorado, US, told BBC News. Full story. I find it really interesting because it emphasizes that there is unity, even on such a large scale. Things that affect us here on earth can also have an affect in the rest of our solar system - maybe even in the rest of the universe! It's mind-boggling, and very Dinotopian. Tyrannosaurus rex would have been able to outrun a footballer, according to computer models used to estimate running speeds of dinosaurs. The work used data taken directly from dinosaur fossils, rather than referring to previous work on modern animals. The University of Manchester study published in Proceedings of the Royal Society B, shows T. rex had a top running speed of 8m/s (18mph). The fastest dinosaur was a small, bipedal and carnivorous species. 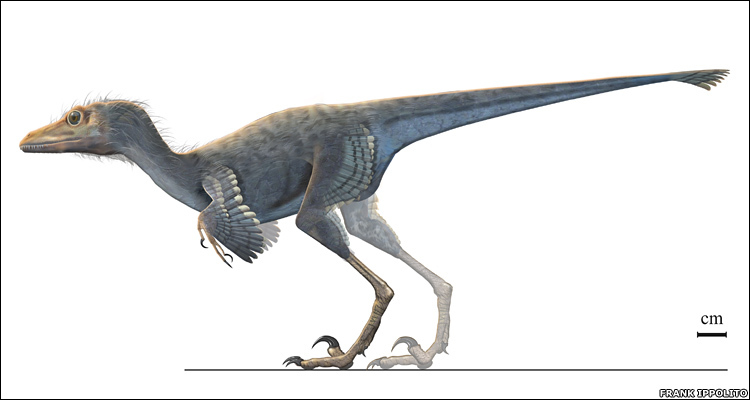 This animal, called Compsognathus, was about the size of a chicken, and could run at 18m/s (40mph). Full story here with a couple of related videos! An extremely rare "living fossil" caught by a fisherman in Indonesia is being examined by scientists. The 1.3m-long (4.3ft), 50kg (110lb) coelacanth is only the second ever to have been captured in Asia and has been described as a "significant find". An autopsy and genetic tests are now being carried out to determine more about the specimen. Coelacanths provide researchers with a window into the past; their fossil record dates back 350 million years. Full story. Neat! But the picture is gross. A giant penguin that preferred the tropics to the southern oceans has been discovered by a team of scientists. It had a long protracted skull and what its discoverers are describing as a grossly elongated beak that was spear-like in appearance. The Icadyptes salasi penguin would dwarf all the penguins who walk the planet today. Full article here. I love the artist's rendition! So pretty. A Tyrannosaurus rex would have had great difficulty getting its jaws on fast, agile prey, a study confirms. A US team has used detailed computer models to work out the weight of a typical "king of the dinosaurs", and determine how it ran and turned. The results indicate a 6 to 8-tonne T. rex was unlikely to have topped 40km/h (25mph) and would take a couple of seconds to swivel 45 degrees. Full story here! Fascinating. I'd love to see some of the computer models. The fossil of a prehistoric sea monster that lived more than 144 million years ago has been found in a river on the edge of west Belfast. Colin Glen could become known as Northern Ireland's Jurassic Park after the backbone of a plesiosaur was uncovered. Such a find was a chance in a million said Paul Bennett, the educational ranger at the park. 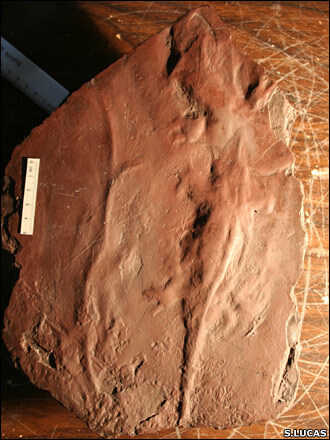 A British palaeontologist has found what he thinks is a preserved Tyrannosaurus rex footprint. The metre-square, three-toed track was discovered in the Badlands of Montana, US, an arid landscape that has yielded many of the finest dinosaur specimens. BBC reporter Jacey Normand travelled to the Badlands of Montana, US, in July. She accompanied Manchester palaeontologist Dr Phil Manning in his quest to find a preserved footprint left by the dinosaur T. rex. To recognise a dino print a good place to start is by examining the bones of the real thing. The closest most of us ever get to that is via casts, like the one at the University of Manchester's Museum. Its 3.5m (12ft) T. rex model resides with other bones and information. The beast is like a watchful guardian over the whole collection. The university's head palaeo-scientist, Dr Phil Manning, points out the enormous size of the animal's feet and explains how, "footprints are just like the shoes which fit the foot". Whew! Busy news day for dinosaurs. Victorian dinosaurs in a London park have joined Buckingham Palace as a Grade I listed monument. The Department of Culture, Media and Sport said the sculptures in Crystal Palace Park, south London, are of "exceptional historic interest". The 15 reptiles were created in the 1850s for the opening of the park when the Great Exhibition was moved there from Hyde Park. Full story! Arthur Denison would have seen these sculptures, or at the very least known all about them. Neat! You should have put this in Barry's Dino Info Post Thread. Not really. Barry's thread is his own separate thing. Barry's thread has nothing to do with dinosaur related news stories. His thread contains information related to specific dinosaur species. These threads are totally different from each other. While I agree, they're separate threads, this information is certainly stuff Barry could benefit from. Scientists think they have found a new species of giant plant-eating dinosaur, Futalognkosaurus dukei, that would have roamed the earth some 80m years ago. It would have measured at least 32m (105ft) in height, making it one of the tallest dinosaurs ever found, Argentine and Brazilian palaeontologists say. The skeleton showed signs that its owner had been eaten by predators. The excavation site in Argentina has yielded a series of specimens since the first fossils were found there in 2000. Full story. It's amazing how much they can tell from just a few bones or fragments. The 315 million-year-old fossilised tracks give an insight into a key milestone in the history of life, when animals left water to live on dry land. The footprints suggest reptiles evolved between one and three million years earlier than previously thought. They were found by UK scientist Dr Howard Falcon-Lang in fossil-rich sea cliffs at New Brunswick. "The discovery was pure luck," he said. Full story! Yay Canadian dinosaur news! ;D The article also contains a photograph with one of our two-dollar coins for size comparison, which I thought was pretty neat. You almost always see American quarters or pennies used for that, so perhaps it would have been better to use a Canadian quarter or penny, as most folks outside Canada don't know how big a twoonie is. Fossilised body imprints of amphibians have been found in 330-million-year-old Pennsylvanian rocks. "Body impressions like this are wholly unheard of," said New Mexico palaeontologist Spencer Lucas. Cool! It reminds me of the hollowed-out shapes they found in the ash at Pompeii. Ok, that's creepy. Giant hyenas, sabretoothed cats, giraffes and zebras lived side by side in Europe 1.8 million years ago. The creatures' remains were among a vast fossil hoard unearthed at an ancient hyena den in the Granada region of south-east Spain. The area appears to have been a crossroads where European animals mixed with species from Africa and Asia. About 4,000 fossils have been found at the unique site. They also include gazelles, wolves, wild boar and lynx. Full story. I've been to Granada and I'd go back again just to see this! A 53-million-year-old spider has been revealed in exquisite detail by scientists from the UK and Belgium. The ancient creepy-crawly had been trapped in amber and preserved in a lowland area around Paris, France. The scientists reconstructed the 1mm creature's original appearance using an X-ray-based medical imaging technique. The pictures, published in the journal Zootaxa, "digitally dissect" the tiny spider to expose amazing details such as the preservation of internal organs. "This is definitely the way forward for the study of amber fossils," said David Penney, from Manchester University and lead author on the study. Full story. Wow! It looks just like a modern spider. The level of detail is absolutely astounding. Speaking of Jurassic Park, eh?? Dinosaurs like Velociraptors owe their fearsome reputation to the way they breathed, according to a UK study. They had one of the most efficient respiratory systems of all animals, similar to that of modern diving birds like penguins, fossil evidence shows. It fuelled their bodies with oxygen for the task of sprinting after prey, say researchers at Manchester University. The bipedal meat-eaters, the therapods, had air sacs ventilated by tiny bones that moved the ribcage up and down. Full story! I had no idea that birds' respiratory systems were so different from that of mammals. There was a bit like that on the fossilized dinosaur heart, as well, right? I didn't see the story about the fossilized heart, Stouthorn! Can you link to it, please?